Since the days of the first photographs, artists have used various techniques to extend the range of lights and darks in their photos. Photographic masters such as Ansel Adams and Edward Weston spent countless hours burning and dodging their prints to create images with extended dynamic range. With the advent of digital photography, new horizons in extending dynamic range are possible. HDR techniques now make it easy to extend the dynamic range of an image well beyond the capability of the human eye.In Creating HDR Photos, bestselling author Harold Davis covers the complete HDR workflow, from choosing the subjects that work best for HDR through processing RAW files to unlock the dynamic power of HDR. You’ll learn how to photograph multiple exposures and blend them into a single HDR image using various software programs. Best of all, you will find out how to control the style of your HDR images, from subtle to hyper-real, using a range of photographic and post-processing techniques. Packed with stunning image examples, Creating HDR Photos brings this essential digital technique within every photographer’s grasp. 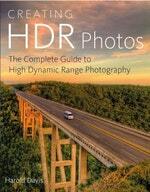 Love Creating Hdr Photos? Subscribe to Read More to find out about similar books.